Thank you so much for everyone who participated in the Funky Junk 1000 Follower Giveaway Week. The winner of the Make Mine Beautiful apron is Barbara Jean from Treasures From the Heart. Here's what she'll be getting. BJ, Please send me your address and I'll get that right out to ya! To see who won the other gifts in the giveaway, head over to Funky Junk. If you didn't win an apron, and you'd still like to have one of your own, I encourage you to peruse my etsy site and get one for yourself. There are several styles and fabrics to chose from, and each apron has been carfeully designed to provide craffters the space you need to carry around all of your supplies. All aprons are made sturdy enough for everyday use. AND, I'm offering free shipping to the US on anything you purchase. Funky Junk herself recently received this one, which you'll be hearing about soon. This apron has 3 optional accessory pockets which slide onto the waistband, and one extra washcloth that snaps on and off for ease of use and cleaning. As you can see, her drill holster has the initials of her business on it. If you'd like to have something with your name just let me know in the checkout notes. What a great gift for the Do it Yourselfer! Congrats to Barbara Jean...how lucky she is! Barbara Jean!!! Woohoo!! Congrats girl!!! Your apron will be fabulous!! I just love these aprons...such a wonderful idea! Your aprons are wonderful Polly. Congratulations to Barbara Jean. You are a lucky girl. Found you while commenting on another blog. Your aprons are adorable!!! Just got your note and then came over and saw your post! Love your aprons and sooo glad I won! 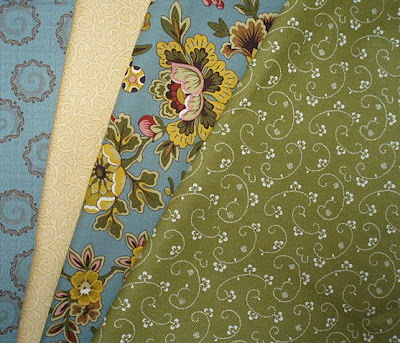 When I get it I will show everyone what a beautiful combination of fabrics it is. Congratulations to the lucky winner! One of those aprons is really calling my name, LOL! Congratulations! Love these aprons. Polly you did an amazing job on them! Congratulations Barbara Jean. I'm happy for you. Polly, these are beautiful work! I love fabrics. I make quilt tops for Amish shops, but I can't sew straight on the sewing machine. Followed you from Lysa's blog.